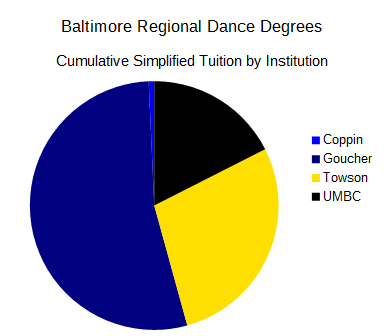 Since Frostburg hasn’t graduated a dancer since 2008 (and Philadelphia is closer to Baltimore than Frostburg), and since UMCP mostly considers itself a DC-regional campus, let’s take those out and focus a bit closer on the Baltimore situation. This reduces the total graduate count to 541 and the average graduation rate to 38(.6) dancers per year. Looks like a definite trend upwards – it’s hard to tell at this scale, but the slope of the linear regression is slightly steeper for the red points. Baltimore institutions are adding about .9 dance degrees per year to the graduation rate (if you include Frostburg and UMCP, it’s about .75 degrees/year). Also worth noting here that the Peabody Institute is introducing their BFA program in fall 2018. To play a bit with money, assuming current in-state tuition, and excluding Frostburg and UMCP (and thus all graduate degrees), the cost of 541 undergraduate degrees in dance is $40.1 million. Out-of-state tuition and more-than-four-years-to-graduate situations increase this number, but I think it’s safe to say that undergraduate dance is a $3 million/year industry for Baltimore and increasing. Baltimore institutions have produced almost 550 dancers in the past 14 years, are producing more as time goes by, and dance is strong enough in Baltimore to warrant (in the opinion of the Hopkins/Peabody institution at least) a fifth regional dance degree program. Data source for graduation data is Maryland Higher Education Commission.